Product prices and availability are accurate as of 2019-04-01 05:10:41 EDT and are subject to change. Any price and availability information displayed on http://www.amazon.com/ at the time of purchase will apply to the purchase of this product. Lavender Hand Sanitizer Spray Warm notes of Tonka bean soften the finish of pure essential oils from aromatic lavender flowers. Directions: Use a spray on each hand and rub hands together to spread evenly. Also use to sanitize your yoga mat, in flight tray table or handle on your grocery cart. 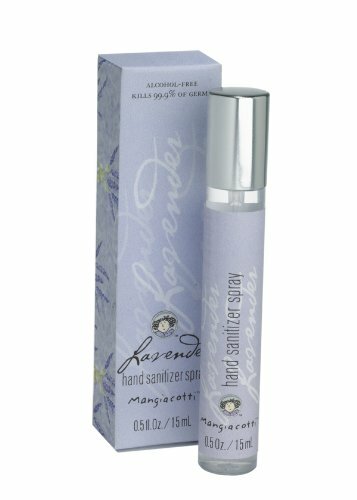 Our alcohol-free hand sanitizer spray kills 99.9% of germs and protects for up to 4 hours. Fragranced with essential oil, this moisturizing spray conveniently dries instantly. Over 100 uses per bottle. FDA approved. Perfect travel size with a beautiful box for gift giving. 0.5 ounce bottle.